Ok, I did finish the inkle weaving I wrote about last. I must first thank Barb and Diane for giving advice after my last post. It went much better, and I think I got fairly consistent with my selvedges. I actually wove more of the warp than I ever have tried on the loom. Only about 3 inches not woven. Several things are seen in the above photo. One is that rough beginning I wrote about before. Hopefully you can tell it did get better in the lower runs. And you can see in the top right corner one problem I had near the end. Yes, one warp thread for some reason, unknown even now, came quite loose. It didn’t untie from its other end but must have come loose enough anyway. That did make that last bit of weaving a bit of a chore. I was always having to pull it straight and fiddle it to make it lay right but we did manage it just so we could get as far as we did. Sometimes I just get something in my head and so continue when really one should quite and call it good. But despite probably pushing it too far, I was quite pleased that after the rough start my pattern and the book’s looks very much alike. Yippy! So here is the completed band. 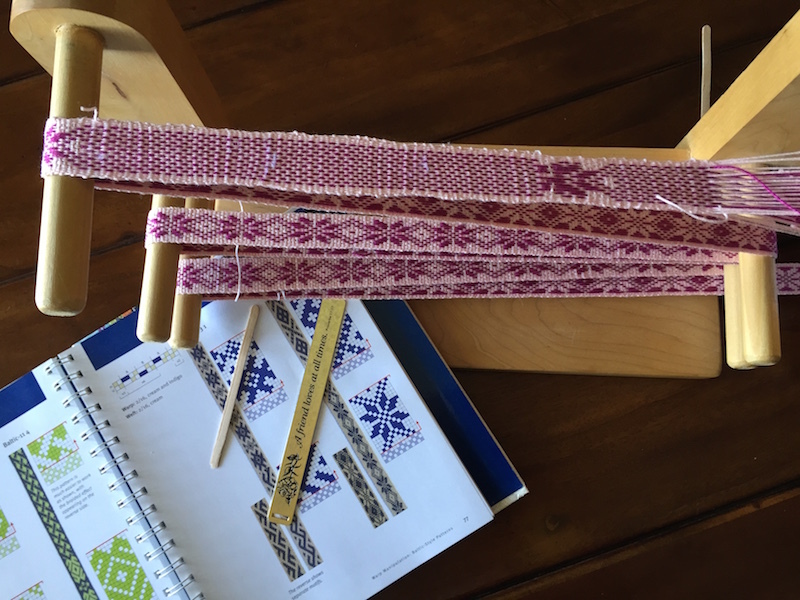 And though at one moment I was done with Baltic weaving – Guess what? Yes, I already want to try another one in the book and maybe weave several to sew together and make a larger piece. I do like to dream big so will see how it goes. I must say one thing this picture does for me is show improvement and for that I am thankful. So will the next one be perfect? Hardly I doubt, but hopefully will make this look sad in comparison. Oh and the colors here are better than the other post. These are how it really looks. Nice band, Julia! The pattern and colors do work together well and it will be exciting to see your next bands. Keep sharing!